OK, so let's clear this up. A jaguar (Panthera onca) is one of those spotty jobs who live in trees and eat children and deer but live in South and Central America. 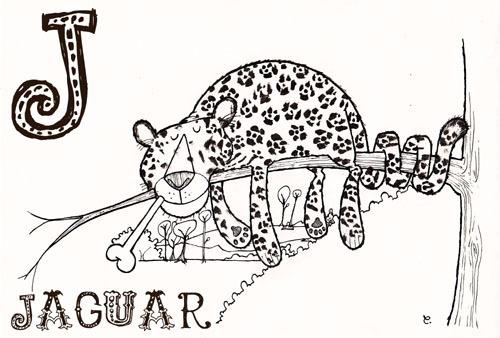 A leopard (Panthera pardus) is smaller than a jaguar but still eats deer and children and live up trees. However, leopards live in Africa and Asia. A panther, meanwhile, can be either of them. Or indeed any other big cat, such as a tiger (Panthera tigris), with the recessive gene which causes melanism, i.e. black colouration. So, J is for that. If you would like to download an A4-sized version of this to print out and learn about the genus Panthera, you can do so here: CLICKUS DICKUS. HURRAH I like its paws and its happy sleepy children-eaty face. However, genetics FACT: melanism in leopards is due to a recessive gene, but melanism in jaguars is due to a dominant gene.